I've never subscribed to any of the various beauty boxes before, because much as I like the idea of a surprise piece of mail every month, I just can't afford to spend £12.95 a month on a box of beauty products that, at the end of the day, I might not even like. 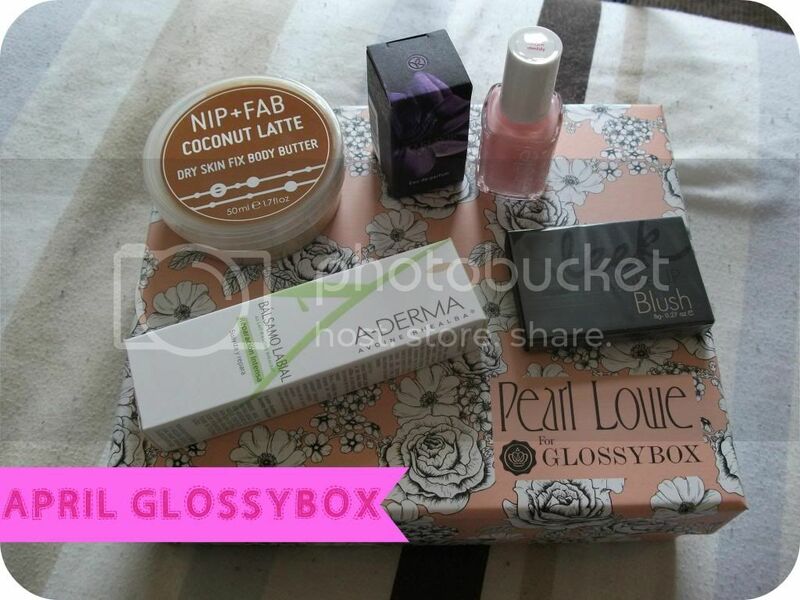 That said, I was obscenely fast to subscribe to Glossybox after seeing a couple of blog posts about the April box, with my mind being made up for me by The Sunday Girl. I was really impressed with the service, actually, with my box arriving on Thursday after I'd ordered it on Tuesday. So, what did I get?! Essie 'Sugar Daddy' Nail Polish, full-size, worth £7.95. I'm really happy to receive this pretty pale-pink shade as I don't actually have anything similar (amazing, I know!) and have been wanting to try some more Essie shades. Yves Rocher So Elixir Purple Perfume, 5ml sample, worth £4.40. I love that this came in an actual miniature perfume bottle rather than the normal perfume sample vials; it just makes it feel a bit more special. As an added bonus, this smells gorgeous, it's definitely a perfume I'd choose for myself and I can see myself buying it to replace one of my current scents once I run out. I was excited to see this in my box as I've never tried any Nip + Fab products and I love Coconut scents. I lost a bit of this initial excitement upon reading the ingredients list and discovering it contains Mineral Oil, which is something I try to avoid in skincare. Nonetheless, I'm looking forward to trying it! I'd never heard of A-Derma before so was happy to discover a new brand in my Glossybox. I'm not short of lip balm so this is the product out of the box I could take or leave; on top of that, the packaging is all in French making it difficult for me to understand much about it (I understand it's a French product but since it retails in Britain, you'd think they could translate their information? ), and its main ingredient is Petroleum, which again I try to avoid in skincare. I own one other Sleek blusher ('Rose Gold'), which I love, so I was happy to see this in my box! This is a lovely matte shade which I'd describe as a deep-peach; I'll have a FOTD post featuring this soon. Altogether, my box had a value of £26.91, so even without the lip balm and body butter I've more than got my money's worth! I have, however, seen other boxes with Balance Me and Illamasqua products, which I'd have loved to receive. Overall I'm happy with the items I received; I have, however, now cancelled my subscription as I don't want to commit to spending £12.95 per month on beauty products I might not want or need, particularly while I don't have an income. I realise that not all months would be as good as this one, and at the moment I don't want to take that risk! At the time of writing, limited numbers of the April box are still available, so if you want to sign up you can do so here. Do you subscribe to any beauty boxes? What did you receive in your April Glossybox? What are your thoughts on beauty boxes in general? I wish got the blush and nail polish!